Before my landscape photography workshop last week with Alistair Nicol, I had thought this aspect of photography was rather subdued and maybe even a bit boring. After all, your camera is firmly attached to a tripod, and you generally stand in one area for long periods of time. If you’re one of those really experienced types, you have a shutter release cable so you don’t even touch the camera when you take a shot for fear of slight camera shake. I’ve dabbled in landscapes for a few years now around my neighborhood, but I knew there was a lot more I wanted to know. So, I contacted Alistair after seeing his amazing work on Google+, visiting his website and discovering he lived in the same South Carolina town as my parents. Miraculously, he was able to fit in a one-on-one workshop with me during Spring Break. As it turned out, Alistair dashed many of my preconceived notions of landscape photography and provided me with one of the most memorable adventures of my photographic career. 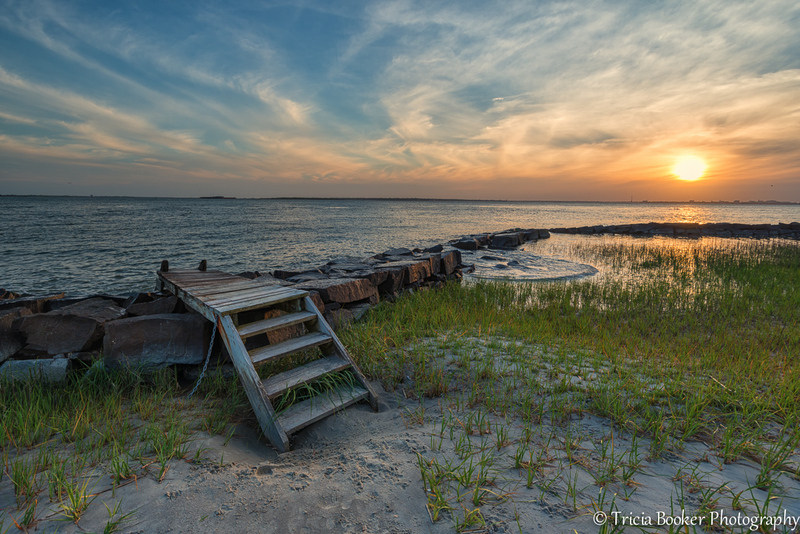 We started off the workshop with dinner and then a sunset shoot on Sullivan’s Island, just outside of Charleston. I’m not sure what he was thinking when we shook hands at the restaurant, but my first thought was that he was so much younger in person than he appeared on his website bio photo. So, another stereotype out the window: not all landscape photographers are guys too old to run around carrying heavy cameras and long lenses. Actually, in hindsight, that observation should have given me an idea of what was ahead. We chatted and got to know one another over a nice meal of Mexican food and waited for the sun to dip closer to the horizon. Landscape photographers, I also discovered, are rather obsessed with clouds and the weather, and he kept a close eye on the windows as we dined. While I appreciate a beautiful sunset with vivid colors and a few clouds, it’s really an obsession with these guys. There’s even a weather app he showed me that features just the clouds; yes, I already downloaded it! Once on the beach at Sullivan’s Island, we started walking, and he explained how he thinks about his shoot and what makes a strong image. There’s a lot of planning, from where the sun will set, what the background will be, what’s in the foreground, the height of the waves and even the boat traffic that will change the wave patterns. His mind is constantly searching for that perfect image, while I have to admit mine kept wandering as the pelicans dove for fish right off the shoreline. It was all I could do not to pull out my 80-400mm lens. Once we found a spot, we set up our cameras. I’m not really friendly with my tripod, and my love\hate relationship with it continued as I struggled to get everything attached and balanced. I managed to get a few fun shots while we talked about composition, and then it was time for the filters. I think Alistair was surprised when I admitted that filters aren’t a part of my daily photographic life, and I don’t even own a circular polarizer. But maybe in the dark ages when I came up the ranks they just weren’t around, or my mentors didn’t use them, but whatever the case the only filters I’ve used are for making coffee. So, my neutral density filter education began in earnest on the beach. I had purchased a few he recommended for the workshop, but being the procrastinator busy editor, I didn’t have time to get out and shoot with them before my trip. I did manage to watch some YouTube videos, which helped me know not to put them on upside-down, but that was about it. Thankfully, Alistair is super patient, so we managed to get everything attached and the camera settings correct, and it was so much fun! Then the tide started to come in. At first it wasn’t too noticeable, but then as we shot some long exposure images from this teetering set of wooden steps, I realized the water had enveloped us. He wasn’t fazed, and simply asked, “How far can you jump?” And so we kept on shooting, watching the waves get higher and the beach farther away. Finally, it was dark and time to go, so we packed up and started to walk back. As it turned out, the angle of the beach and the high tide created a funnel effect, and we ended up climbing over debris, dunes and scaling the guard wall to get back. But while we were standing on one wall, he became mesmerized by the waves and the starry sky, so we paused to take some night shots, painting the surf with flashlights. How cool! After a few waves tickled the lenses of our cameras, we called it a night and headed to the parking lot. Then, he asked the big question? “Can you ride a bike?” Umm. “Yeah,” I replied wondering where this was going. “OK, I’m going to bring two bikes for tomorrow morning. The gates to Botany Bay don’t open until 6, and the sunrise is at 6:48. I want to be at the beach by 6:15 and it’s a two-mile ride.” After a few calculations, he says, “I’ll pick you up at 4:20.” That’s a.m.
Wow, so by the time we get home we’ll be able to take a shower and get up again. This is the life of landscape photographers? I never imagined. What could possibly happen? I’m shooting landscapes not dangerous, 1,500-pound animals running toward me. 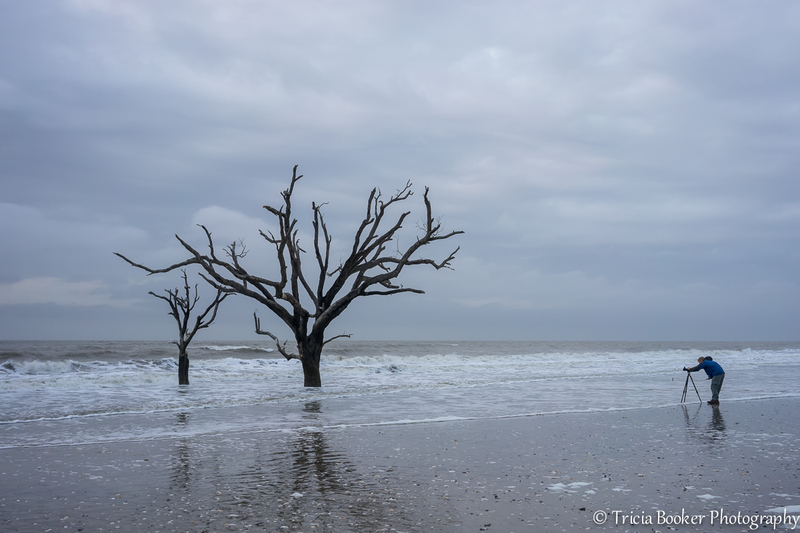 The drive out to Edisto Island and Botany Bay was slightly over an hour, but it went by quickly, maybe because Alistair isn’t a slow driver and there was little traffic. The only small worry I had was about halfway there, on some dark, remote road, he admitted the check engine light had come on the day before. “I wonder how long it would take someone to find us?” I thought as the marshes and fields whizzed by. The bike ride to the beach was actually easier than I expected. After riding all around Northern Michigan last summer, the flat sand was a piece of cake. Alistair had given me the better bike and was carrying some of my gear on his back, so he had a much harder workout than I did. The ride was both peaceful and eerie, as the nocturnal birds and animals were still making their presence known, and the nearly full moon kept peeking in-and-out of the flimsy clouds rolling in. The beach itself took my breath away when I stepped out from the trail. 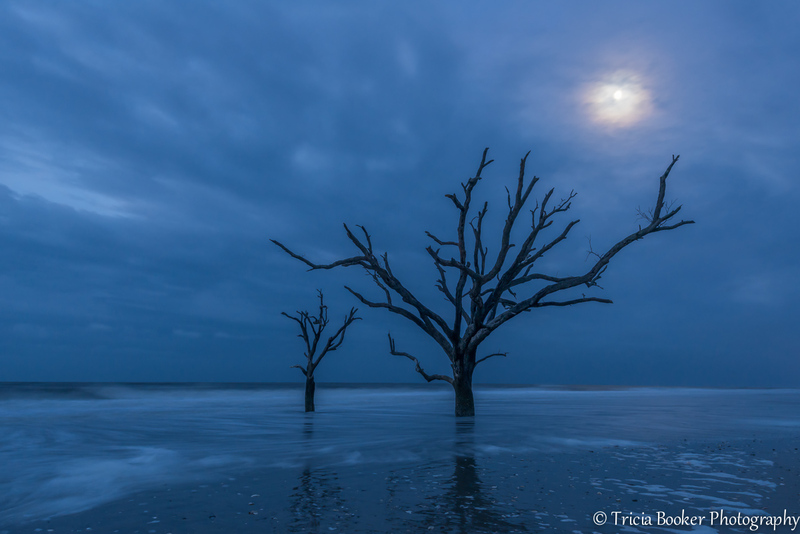 It looked prehistoric, with dead trees and debris scattered all along the beach, and seeing it for the first time in the moonlight was an experience. Alistair had warned me that the light changes quickly, and he wasn’t kidding. We parked the bikes and set up our cameras and tripods. I think I’d taken three images when the moon disappeared completely, changing the complexion of the sky. As we adjusted our compositions and moved down the beach, the sky brightened. I realized that any expectations of a relaxing morning shooting landscapes on a beach were gone, as we not only worked quickly to change filters and settings but also had to run back and forth up and down the beach to avoid being soaked by the incoming tide. 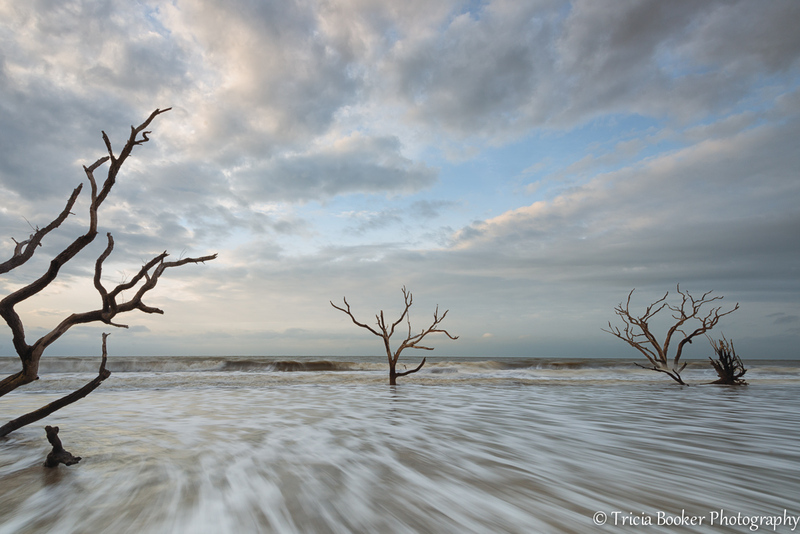 It was an intense few hours of shooting, as the waves grew stronger and louder and the approaching storm drew closer. The only other person on the beach with us turned out to be a 16-year-old high school student from Richmond, Virginia, who had brought out his mother’s camera and tripod to shoot the sunrise. What an impressive young man. I was completely immersed in shooting and at one point lost sight of Alistair. The last time I saw him he was standing on a downed tree with his tripod carefully balanced, surrounded by water, with his camera focused out into the ocean. Normally, I might have worried, but, hey, now I understand that he’s a landscape photographer. Eventually, Alistair came to find me and said we should start heading back to the bikes because high tide was fast approaching. In a déjà vu moment, we realized the tide was closing in faster than we thought, and again we ended up having to hurry and climb over downed trees and debris to get back. It was exhilarating and fun, and on the bike ride back to the car we stopped to photograph the incredible trees that arch over the roadway. We also stalked a large bird on the way back, which turned out to be an immature bald eagle, so I was able to handhold my long lens and feel a moment of photographic competency. 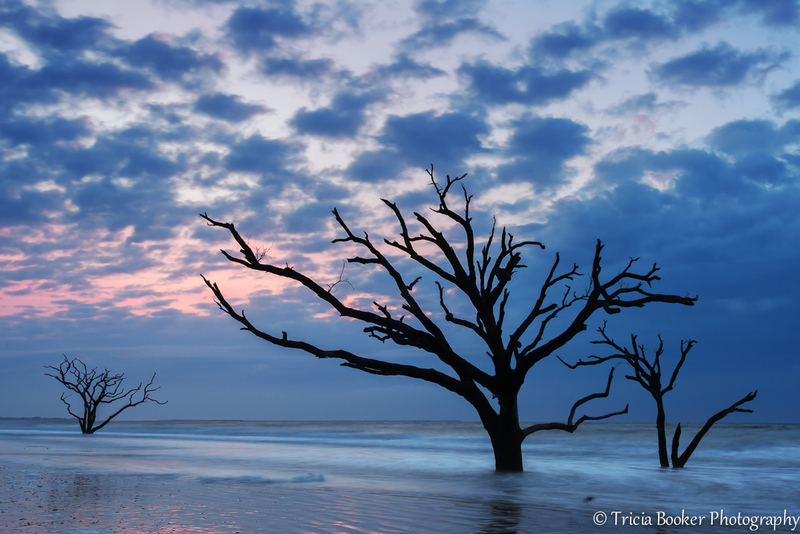 Over a late breakfast in Edisto, we downloaded some images to our computers, and he gave me some post-processing tips. I still have so much to learn! As we got back into the car, the drizzle started, so our timing couldn’t have been better. And, it turned out, the check engine light went off somewhere along one of the bumpy back roads, so our drive home was thoroughly relaxing. So, what did I learn from this experience? It turns out that’s the question my family asked first when I returned home (in one piece). To them, I’m already a professional photographer, and what more could there be to know when you’ve been paid to shoot for most of your life? Well, as it turns out, I learned more than I could have imagined, and it wasn’t just about landscape and long exposure photography, although there was plenty of that as well. Once again, I was reminded how important it is not to let generalities dictate your perceptions, how fun it is to see life through another person’s viewpoint and, maybe most importantly, that taking chances and trusting your instincts can lead you to some wonderful places. To see Alistair’s images and for more information on his workshops, please visit these websites: Coastal Insight Fine Art Photography and Mountains To Sea Workshops. Sounds like an incredible experience. You’re making me think about what courses I want to take. Beautiful photos. Thank you, Cynthia! Yes, it was a great experience and so much fun to continue learning! 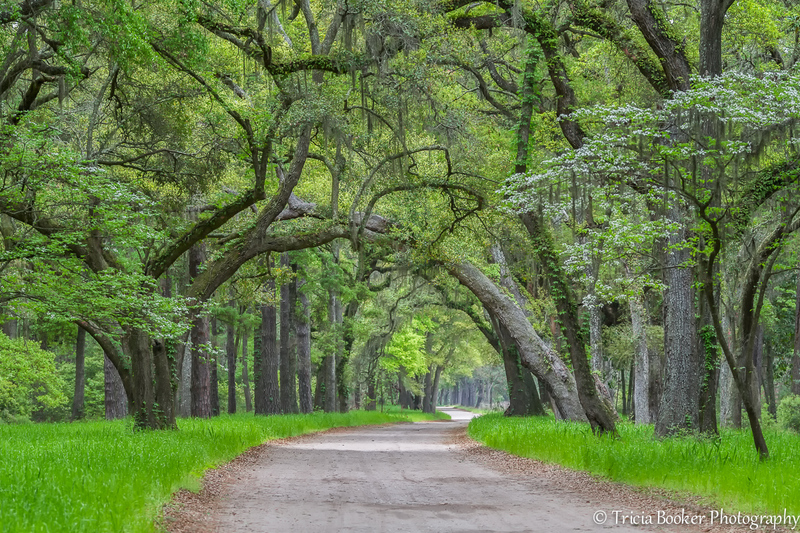 Beautiful, beautiful shots, especially the trees arching over the road. I’ve always liked seeing that. Impressive! The photos, the learning, the insight, the teacher. . . and the student. Ain’t learning grand? This sounds like a brilliant experience! The early morning sounds painful, but the lessons – both photographic and general – seem more than worth it. Thank you for sharing them with us. Haha! Yes, the morning was tough as I’m not a natural morning person! But I’m glad I didn’t let a little sleep get in the way of a great experience! Thanks for narrating your experience — this was fascinating to read. I was particularly taken by your second (sunset) photo with the steps and dock. Was that an HDR photo, or processed in a particular way? The light is incredible. Hi Sue! Thanks for reading all of the way through! I didn’t process that with HDR but used some filters in Nik Software. Alistair showed me a new process that incorporates Lightroom and Nik. I used the Detail Enhancer and the Brilliance and Warmth filters primarily. Hope that helps! Yes, that was helpful, thanks. I know nothing about filters or the Nik Software, but will start reading up on some of this. 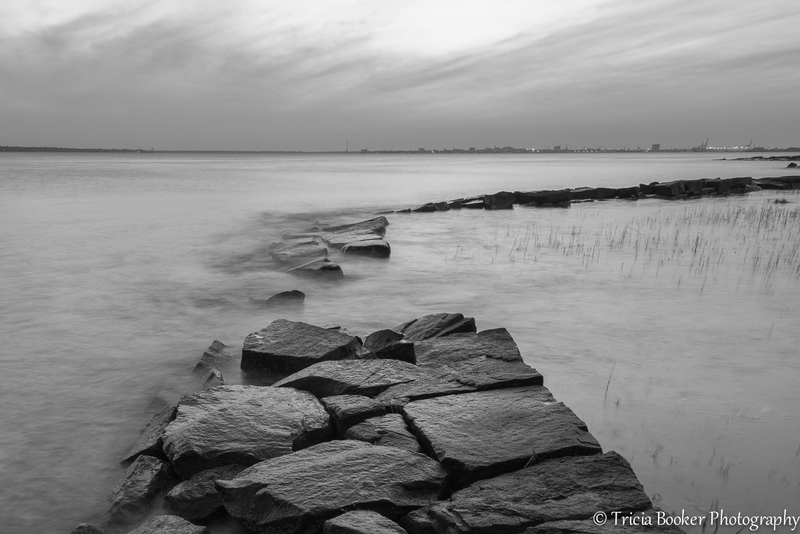 Didn’t you use a 2 Stop ND Grad filter on the sky @Tricia. That helped keep the light in a range that the camera could handle. Thank you so much, Lynn! I have a special place in my heart for Texas now that I’ve spent some quality time there. I did venture to the island last summer with Carrie and Elise; in fact, I credit biking around there last year for helping me on this adventure! The photo ops are great in Michigan, and now that I know more about long exposure photography I’m eager to get back to experiment! Look forward to seeing you there!! Fantastic! What a great adventure and your photos are exquisite.